On Sunday, a W.D. trough was dipping down to Rajasthan and adjoining north Gujarat and west Madhya Pradesh. The W.D. trough and the ‘low’ have almost interacted and, now, should to some extent strenghten the W.D. Rains can now be expected to continue for another 2 days across central India, northern and northeast India. IMD has also confirmed that -" the W.D. and the monsoon easterlies would interact to bring fairly widespread rainfall with isolated heavy to very heavy falls over Uttar Pradesh, Uttarakhand, Himachal Pradesh, East Rajasthan, and Haryana until Tuesday." I would predict very heavy rains, as the combined strenthened W.D. moves eastwards, in the Himalayan foothills adjoining Bihar and sub-Himalayan West Bengal, Uttar Pradesh, Uttarakhand and H.P. Regions of U.P. are already recieving heavy rains, like Agra with 115 mms today. The well-marked low-pressure that caused some of the worst flooding in Maharashtra, Karnataka and A.P. 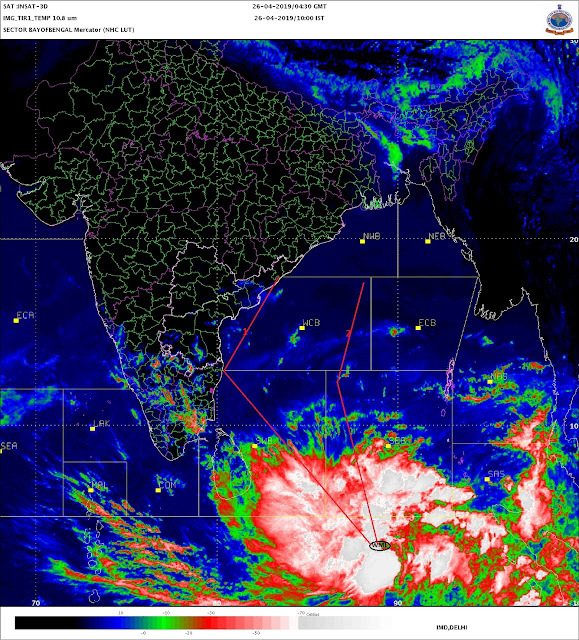 has weakened into an upper air system, and was over south Gujarat/Maharashtra on Sunday. Large tracts of Northern Maharashtra and the adjoining M.P.regions were lashed by heavy rains on Sunday and Monday morning. I would now estimate the rains in this region to gradually decrease, starting Monday evening. The rainfall in interior Maharashtra would reduce from Tuesday, and the coastal regions can expect rains, though less than the current spell, till Thursday. Gujarat should go dry from Tuesday. For the south, its another story with the new lows projected in the bay. Mumbai: Substantial reduction in rains from Monday night. Much less rain on Tuesday, a few showers in some parts. Rainfall reducing from Wednessday, at least till the weekend. The city recieved heavy thundershowers with gusty winds Sunday/Monday, with Colaba getting 115 mms in these 2 days, and S'Cruz recieving 105 mms. Yes ! The October totals cannot be neglected like we discussed earliar. The vortex low actually traversed across Mumbai, from east to west on Sunday. This was apperant as the wind direction changed 180 degrees from north-east to south-west in a 12 hr. period. Mumbai was the coolest city in the state (outside M'shwar) on sunday ! The day was highest at 24.7c, 7c below normal ! Cool for a Mumbai day, even if it were December !